- Teachers from Telangana and Andhra Pradesh also perceive a decline in students’ values & ethics and discipline in the past five years. Hyderabad, 1September 2016: On the occasion of Teachers’ Day, the teaching community has collectively voiced their opinion on the current engagement level of Indian students and also identified the critical enablers to enhance student engagement through the fourth edition of Pearson Voice of Teacher Survey, 2016. Teachers feel 63% students in Telanganaand 52% students in Andhra Pradesh are actively engaged in learning. The survey carries significant insights from teachers that can contribute towardsthe larger vision of the Government of India towards ensuring quality inclusive learningand improving the learner outcomes in India. The Pearson Voice of Teacher Survey 2016 was conducted across the country in July-August 2016. The survey covered 49 cities in Andhra Pradesh and 24 cities in Telangana. National findings show that teachers feel that only 55% of the students are actively engaged in learning.The survey highlights the significant variation in student engagement – by institution, level and states. Teachers opine that students from government schools are far less engaged (51%) than those in private schools (67%).Further, student engagement is perceived to drop from the school level (61%) to higher education level (50%). While the teachers (73%) feel that participation in extra-curricular activities has improved in the past five years, they perceive a noticeable decline in students’ values and ethics (42%) and discipline (38%). The teachers (29%) feel that excessive use of personal gadgets by students and lack of parental support (12%) are the key deterrents to student engagement. The survey included 12 key inhibitors to engagement.Particularly, in private schools across India, excessive use of personal gadgets by students (27%), lack of parental support (24%) and too much pressure to perform (15%) are identified as top factors for low student engagement. Lack of parental support (43%) is a much bigger barrier to student engagement in government schools, followed by challenges faced by students outside of school/ college (13%) and their past performance (11%). Only 49% of respondents feel that they receive adequate training. ​​Adequacy of teacher training is perceived to be much higher among school teachers (70%) than higher education teachers (30%). As a silver lining, 59% of overall teachers surveyed believed that thestudent engagement level has increased in the past five years. The upward student engagement trend is not only identified by teachers from private schools (81%), but also by the government school teachers (74%). However, at higher education level, the improvement in student engagement ismore subdued as compared to schools, with only 41% teachers in private and government colleges seeing improvement in engagement. 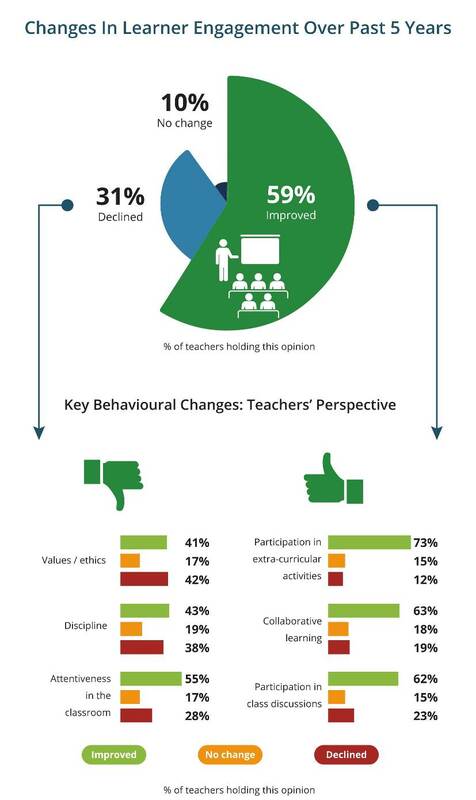 To further improve student engagement, teachers have identified the use of real-life examples & stories (86%), group discussions/activities (83%) and use of technology platforms (81%) as the most useful tools and techniques.The teachers chose these factors from among 14 enablers of student engagement. On the other hand, teachers at government schools have assigned highest importance to counseling sessions with students, regular teacher trainings and audio-visual content for building student engagement. “While the teachers feel that excessive use of personal gadgets is an inhibitor to student engagement, interestingly, they have also shown widespread acceptance for technology aid inthe learning process. This clearly calls for building a framework to effectively integrate the technology platform into traditional learning to achieve desired student engagement levels and learning outcomes.”Mr. Mehrotra added. Released close to the Teachers’ Day every year, the Pearson Voice of Teacher Survey is an annual initiative of Pearson.Now in its fourth edition, the survey focuses on key challenges facing the Education sector in India and shares teachers' perspective on the changing dynamics in the ecosystem. The survey, fielded in July 2016 - August 2016 represents the views of 6,494 teachers from schools and higher education institutes across 546 cities and towns, teaching over 18.9 lakh studentsin the country.Spire Research and Consulting, one of the leading strategic market intelligence consultancies in Asia Pacific region, partnered with Pearson for this survey. Pearson is the world’s learning company, with 40,000 employees in more than 70 countries. From school education, test preparation and higher education to professional qualifications, Pearson’s books & publications, curriculum materials, multimedia learning tools, testing & assessment programs and integrated services help people of all ages make measurable progress in their lives through learning. Pearson's work spans through three core verticals – a) K-12 or School education b) Higher education and test preparation and c) Vocational and professional education. Established in India since 1998, Pearson has introduced its wide range of products and services in educational institutes as well as directly to the learners. To know more about us visit www.pearson.co.inand follow us on www.facebook.com/PearsonInand https://twitter.com/PearsonIn. About Spire Research and Consulting ..! Spire Research and Consultingis a leading strategic market research consultancy specializing in global emerging markets - the Asia-Pacific, Latin America, Middle East, Africa and Russia/CIS. Spire focuses on holistic research projects which integrate traditional customer research with knowledge of the broader business eco-system. The Spire Group has delivered over 1,000 market research and consulting projects for over 50 Global Fortune 1000 firms.